Instant Pot Pork Tenderloin with Orange Rosemary Glaze is about to become your new go-to meal! It’s simple enough for a family meal and impressive enough for a special occasion. Easter is coming up soon…If you have guests who aren’t fans of ham, this dish will satisfy even the choosiest eaters! 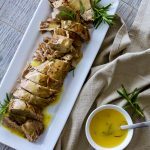 Instant Pot Pork Tenderloin with Orange Rosemary Glaze is so easy to toss in the Pot you’ll never want to cook a tenderloin any other way. I use bottled Balsamic salad dressing to marinate the meat, which gives the otherwise often bland tasting pork a delicious flavor. The dressing can be purchase in any grocery store. Oil-based salad dressings are a perfect marinade for meat because they contain oil and also vinegar or another acidic ingredient which helps tenderize the meat. I used a very inexpensive brand for this recipe (check the recipe notes) and love the result. You all know by now how amazingly easy it is to cook a meal in the Instant Pot. I love the versatility of the “sauté” setting in the pot. It takes just a few minutes to get the Instant Pot up to the proper heat setting to give your meat a nice brown coating on the outside. I highly recommend using the saute mode before turning the pressure cooker on. I’ve cooked pork tenderloin for years and love it when the pork is fork-tender. Usually, this takes hours to achieve in the oven or the slow cooker, but in the Instant Pot, it takes about 5 minutes of pressure cooking, and then another 10-15 minutes to naturally release pressure. The result of using the pressure cook method is fall-apart meat that is flavorful and unbelievably tender. If you’re looking for other pork tenderloin recipes that aren’t Instant Pot recipes, I love Pork Tenderloin with Sesame Ginger Glaze and Warm Cabbage Slaw (top photo) and Stuffed Pork Tenderloin with Balsamic Mushroom Gravy . Marinate the pork in Balsamic dressing in a ziplock bag for 2-24 hours, turning bag over every few hours if possible. When ready to cook, turn the Instant Pot to high saute setting and remove the pork from the marinade, let excess marinade drain back into bag and set pork on paper towel. Discard marinade. Add 2 tablespoon of olive oil to the Instant Pot. Pat the meat to dry a bit with a paper towel and sprinkle generously on one side with salt and pepper. Place the meat, seasoned side down in the hot Instant Pot. Sear meat until browned on one side, before flipping the meat, season on opposite side with additional salt and pepper. Sear opposite side. Using the manual setting, turn the pot to 5 minutes. Add 1 cup of broth (chicken or beef) to the Instant Pot. Close and seal the lid into place. When the timer goes off, allow the pot to naturally release pressure for about 15 minutes. While the meat is cooking, pour orange juice, lemon juice, sugar and cornstarch into a small sauce pan and whisk until smooth. Cook over medium high heat, bringing ingredients to a boil. Whisk and cook until the glaze is thickened, about 3-5 minutes. Add rosemary to sauce. Remove from heat until ready to serve. When meat is done, remove from Instant Pot and set on cutting board. Let sit for about 5 minutes before cutting. Slice into 3/4 inch slices with a sharp knife and place on serving platter. Drizzle with some of the glaze, and place remaining glaze in a bowl and pass with meat. Garnish with additional fresh rosemary leaves. -Make sure to purchase tenderloin for this recipe, not pork loin. Pork tenderloin is an especially tender cut of meat and is sold in a long thin package. Often times, Hormel is the brand on the packaging. At Costco, pork tenderloin is sold in a two pack, meaning two packages, each containing two pork tenderloin, or enough for double of this recipe. -This recipe is easily doubled, brown the pork two at a time in the pot, but pressure cook (all 4 pieces of meat) together. If you are doubling the amount of meat, I suggest pressure cooking for about 8-9 minutes. -If you like, you may spoon a bit of the juice left in the pot over the meat after placing on a platter. Then spoon some of the glaze over the top as well. -I used Kraft brand Balsamic Dressing in this recipe, but any brand may be used. How would I cook this with my slow cooker? Hi Amy, I have a recipe called Pork Tenderloin with Sesame Ginger Glaze, you can use the method on that recipe for cooking. Thanks for reading ABK! We have a smaller tenderloin…same cooking time, do you think? First time fixing pork in the IP and I’m a little paranoid. ???? Stacy, You can reduce the time by a couple of minutes. Don’t worry! It will be very tender and moist. It’s difficult to overcook meat in the IP. I have experimented with several different cooking times and have had great results with the amount stated. Good luck and let me know how it goes! How about a larger tenderloin? We just bought one that is 4.2 lbs. Any suggestions on how much to increase the time? We’re new to the IP! I am new to my instant pot. Is it possible to use orange juice instead of broth? Or possible to put sliced onions and sliced oranges right in the pot for flavoring? if you replace the broth with oj, the sauce will be much more fruity flavored. Not sure if I would do that! If you put onions and oranges in the pot they will most likely come out very soft. Maybe not what you have in mind, I would add those ingredients after the pork has cooked, maybe for an additional 5 minutes after pressure release. Set the timer for 5 mins manual setting and then manually release the pressure. My pork turned out dry. Does that mean I cooked it too long or not long enough? Thanks for your help. Most likely, too long. One of the most common mistakes in the IP is the meat is overcooked. I found the time on this recipe to be right on in terms of cooking until tender. Make sure you are using a Tenderloin, and not a Loin roast, there is a huge difference in the way the meat will cook up! Apparently a pork tenderloin that’s about 1.5 pounds takes only 2 MINUTES at LOW PRESSURE with about a 15 minute natural release. You will take it out and if it’s 137 degrees or more (F), take it out and let it rest until it comes up to 145 degree (F). If it’s less than that, you’ll have to cook it a bit more, but not too much. so that it comes to the desired temperature. The problem with most recipes is that they tell you to cook a tenderloin way too long so that it complete dries out. Si, if you double the recipe do you increase the amount of cooking time in the instant pot? Beth, Sorry I missed this earlier! No, the time should be the same. I’m guessing you can also cut the liquid so it is not quite doubled as well. Let me know how it turned out! Again, sorry for the late response. I cooked this exactly according to the directions (with a pork tenderloin, not a loin roast) and it was quite dry, although the flavor was very good. I am relatively new to the instant pot, but when I hit “manual” it automatically defaults to the high pressure setting (rather than low pressure) and since the recipe didn’t specify, I just kept it at high pressure. Could that have been my problem? I’m sorry this recipe didn’t turn out as the recipe stated. What size was your tenderloin? Yes, the Manual setting and high setting are the same. Am I able to half this recipe and cook it for half the time? Just go ahead, half the recipe and cook for the same time. Yum. 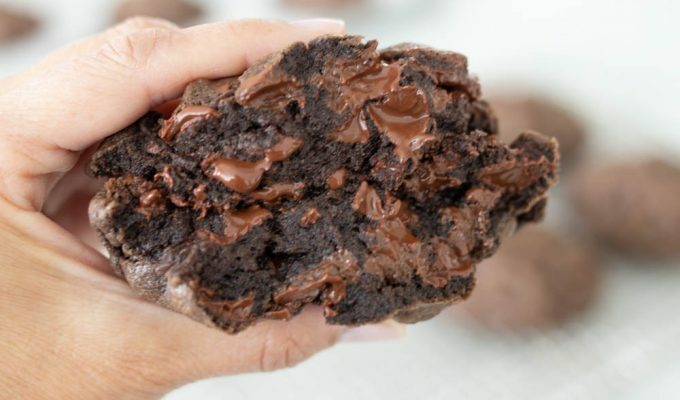 What about oven directions for this recipe? Melené, here is a link to another pork tenderloin recipe that has oven directions: http://abountifulkitchen.com/2014/05/pork-tenderloin-with-sesame-ginger.html/. You can use this same oven method for the Pork Tenderloin with Orange Rosemary Glaze. Hope this helps! In the recipe, your directions indicate only 5 minutes cooking time at high pressure and then 15 minutes to naturally release. But in your introductory comments, you stated that “in the Instant Pot, it takes about 20 minutes of pressure cooking and then another 10-15 minutes to naturally release pressure.” So I’m confused about the optimal time for pressure cooking the pork tenderloin. Thanks for all of your recipes! I’ve been a fan for years! Im so sorry! There was misprint originally, the recipe should have said 5 minutes instead of 25 minutes. It is corrected now! Thanks for reading ABK for so many years!